(Buteo jamaicensis) As they circle and soar, they can spot a mouse from 100 feet up in the air—about ten stories high. What does the red tailed hawk eat? The Red Tailed Hawk is a carnivore. They dine on small to medium sized mammals, primarily mice, ground squirrels, jackrabbits, birds and reptiles. 12 to 16 years in the wild. How many red tailed hawks can be born at a time? The female lays 1 to 5 eggs. 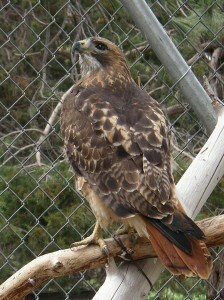 The most common hawk in the United States, the red-tailed hawk is also found in Central America and the West Indies. As they circle and soar, they can spot a mouse from 100 feet up in the air—about ten stories high. Red-tailed hawks mate for life. Their courtship includes a spectacular aerial acrobatics dance. Each bird flies in circles high in the sky. Then the male makes a steep dive toward the ground, turns, and flies straight back up. He may do that several times. The pair then grab each other by their talons and fall together, spiraling, toward the ground. They fly apart, and the dance ends. They get their red tail at one year of age. Our Red-tailed hawks are named Baja, Noname and Squints. Squints – came to us in 2011 and he had been a falconer’s bird. He had a damaged right eye and could not be flown by the falconers so they donated him to the zoo. He is an ambassador animal for our facility and we are hoping to fly him short distances for educational programs. Baja– is a very big red-tailed hawk, so we’re pretty sure she is a female. She has an injured wing and was found by someone who kept her in a small cage. We went and rescued her and brought her back to the zoo. She came to us in 2009 as an adult. Noname – came to us in 1999 with a broken wing which eventually had to be amputated.